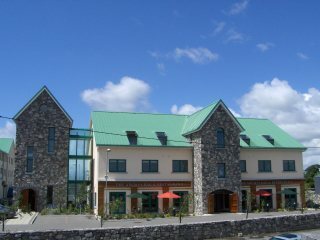 Galway East Tourism - Arches Hotel in East Galway, West of Ireland.Galway East Tourism - Arches Hotel in East Galway, West of Ireland. Sense the appeal of our warm and friendly environment as you enter the Arches Hotel. This well-appointed Family-run hotel situated in the heart of Claregalway, County Galway overlooks the original Nine Arches Bridge where the Clare River once flowed. Our three star accommodation near Galway Airport and the city centre has 21 beautifully appointed rooms. Includes Hair Salon, Beauty Therapist, Yoga, Jewellers and Boutiques. Sense the flavour of our dedicated Feile Bia approved restaurant, which is both private and intimate, perfect for cosy gatherings. Cro? na Bia offers an excellent variety of scrumptious foods and fine wines. Sample the unique atmosphere as you join us in the Arches bar where you can relax and enjoy the flame of an open fire or join in the unique atmosphere enjoyed by guests and locals alike. Maybe you just want to meet a friend for a cup of coffee. Why not treat them to one of our delicious home-made scones or deserts?